We get lots of inquiries from couples who want to share their experiences in the pages of PMM. The stories come from all over the world and range in nature from the bliss of a special cruise to the foibles of lessons learned. When we decided last spring to add a seventh issue this year, by coincidence the dialogue occurred at a point when we had received a wave of inquiries about the Great Circle Route, both from those who had done the trip and from others wanting to know more about this grand adventure. The trip is a circumnavigation of the eastern half of North America. Among the trawler community, we know that a trawler is the ideal boat in which to do it. As much as the Inside Passage is the pearl of cruising the Pacific Northwest, the Great Circle Route brings you around North America on a long inland cruise that has much to offer. It has many variations but is roughly 5,400 miles long and can take up to a year to complete. It winds up the East Coast into the Great Lakes between the United States and Canada, then meanders down the Mississippi and/or Tenn-Tom waterways to the Gulf of Mexico. The route embodies great diversity and variation. It crosses through many great cities, all worth exploring in depth, such as New York, Chicago, St. Louis, New Orleans, Miami, Savannah, Charleston, and Baltimore. It visits hundreds of small villages and towns that line the shore, each with a story and something to offer the cruising traveler. The diversity of cuisine alone is worth the trip. The waterways provide a unique experience for those who travel by boat. While most who set forth on this trip are retired, that is certainly not a requirement, and many creative people have done the trip over several years by spacing out the legs and working around them. I have enjoyed several legs on different boats, and I&apos;ve found it matters not whether traveling at 7 knots or 16–the adventure is there regardless. Cruisers can eat out every night or anchor out and stay aboard, so the economics can be adjusted to fit almost any budget. Most do the Great Circle in a counter-clockwise direction, as the other way requires fighting current on some of the southerly-flowing rivers, a definite consideration for a trawler that cruises most efficiently at 7 knots. In this instance, it pays to go with the flow. Another wonderful highlight is meeting other cruisers doing the trip along with you. Much like migrating birds who seasonally head south, you&apos;ll meet lots of other boats and crews, and the rich experience of cruising through Americana is much enhanced through friendship and camaraderie. Passing cruisers have much to share about best-loved stops, restaurants, side trips, walking tours, wineries, golf courses–the imagination runs wild. It is a special experience that few who have done it regret. So here it is. I bring you our seventh issue–with a special focus on the Great Circle Route in its many flavors. Although several enterprising folks have written guides and books on this trip based on their own experiences, they tend to represent one perspective. This issue, on the other hand, offers a collective blend. We&apos;ve compiled stories from sources that tell the tales of many experiences, and I trust you will find it as informative and enchanting as we have. It was great fun to put together, and we balanced the stories to cover the locks, the canals, the rivers, the sounds, and the coasts. We visited the historical places and explored the towns that comprise this waterway experience. And there is enough general information to hold interest for our West Coast readers, although even out there, I meet more couples each year who have been inspired to undertake this trip. So sit back and enjoy this issue. It is a great read, and we thank our many readers who contributed to make this happen. 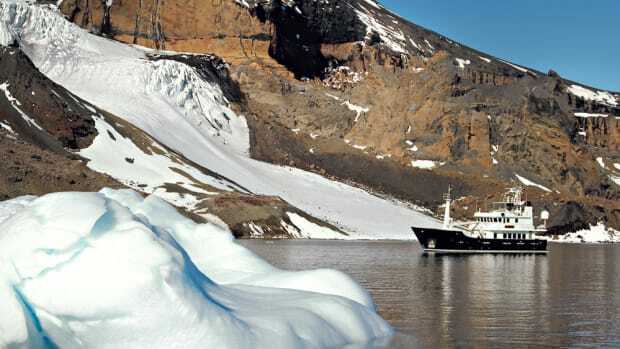 The Great Circle Route truly is an adventure of a lifetime. From the Pilothouse, "Revvin' Up!" From the Pilothouse, "Great News"